Aufruf for Matthew Foster last Shabbat. We‘d like to welcome you to our Shabbat morning service at 10:00, which will be followed by a brocha, sponsored by Michelle Margolis to celebrate her birthday. This Friday evening (18:00) Debbie will host the Kids’ Club. There is no Teens’ Club this Friday due to the Netzer Mini Machane. A hearty welcome to all participants of the Netzer Mini Machane, taking place at Bet David this weekend. 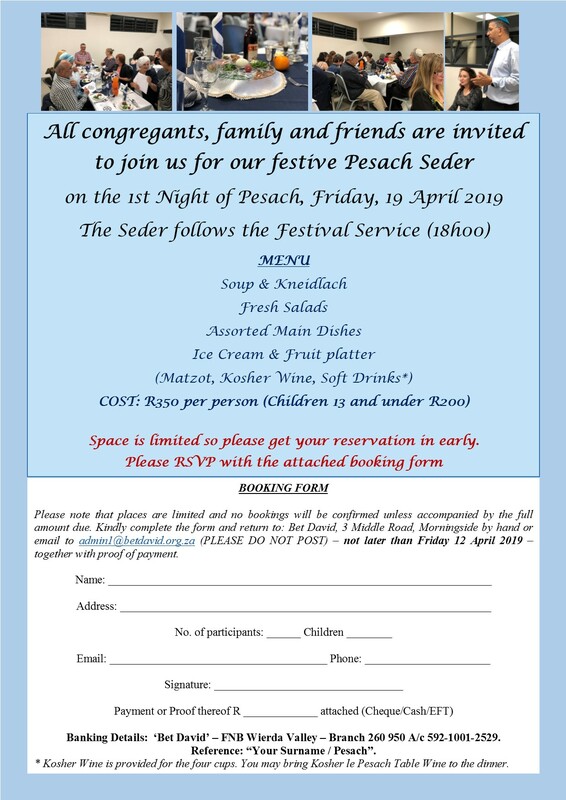 Pesach is little over a week away and we still have some spots open for our communal seder on the first night of Pesach. Please get in touch with Glynnis 011/7837117 or admin1@betdavid.org.za to book your place.